The Victron Phoenix Inverter 48/3000 (PIN483020000) is the second-largest 48V Phoenix inverter.Especially in terms of communication there are several new features which make the 48/3000 a future-proof investment that provides a constant performance of 2400W. This device converts a 48V DC battery current into a 230V AC current with a pure sine wave at 50Hz which also allows the supply of very sensitive electronic components. This inverter comes with excellent consumption and efficiency characteristics and moreover supports the parallel and three-phase operation with other Phoenix inverters out of this series. All Phoenix inverters out of the 12V/24V/48V-3000-5000 series are equipped with a RS-485 data port. Via the optional VE Interface MK2-USB you can connect the inverter to a PC or notebook. This allows many new possibilities in terms of configuration and monitoring. The main focus during the development of the new Phonex series was to create an inverter with a clean sine output and high efficiency. Thanks to latest hybrid-HF technology Victron was able to create a high-quality product with small dimensions and low weight which provides any needed performance easily. Additionally SinusMax technology, new within this series, allows very high peak-currents of 6000W. The most important characteristic about this technology is a very high starting current capacity which is not possible with common HF-technology. 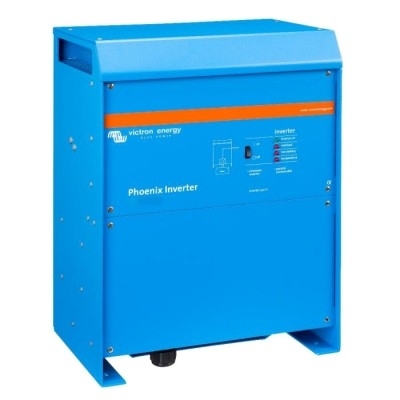 Phoenix inverters can easily handle high starting currents of, for example, refrigerating compressors, tools and others. Up to six inverters can be connected parallely to increase performance. Also three-phase operation is possible. Automatic load switch: For smaller performance demands we recommend the Filax auto-switch. With its help computers and other sensitive electronic devices can be supplied free of interruptions as the switching times are very short (<20ms).